This is to announce that Lucy Hutchinson has decided to step down as Hon Membership Secretary at the end of the year after 10 years in that role, and she will be retiring from the Board at that date. On behalf of all members I would like to extend my enormous thanks to her for her dedication and commitment to the task and from a personal point of view for all her invaluable support and advice as a member of the Board. 1st January 2019 will take on the role of Hon Membership Secretary. I would like to extend a warm welcome to him to the Board and wish him well in his new role. In a repeat of last seasons final it was once again Luke Danby and Adam Dolman playing in the final of the A Grade Andy Dawson. Luke played a very fast paced first set to close it 6/2 but Adam then started serving a lot more accurately and also upped his pace to completely turn things around in the second set to win it 6/1. 2/0 to Luke and then quite quickly Adam back to 2/2 and a very tight game with two chases better than two saw Luke sneak it and then he flew through the next 3 games to retain his title for another year 6/2 1/6 6/2. The tennis really was of a great standard and enjoyed by all those in the dedans! This year we had a full compliment of 8 pairs battling out to win the Robinson Trophy. 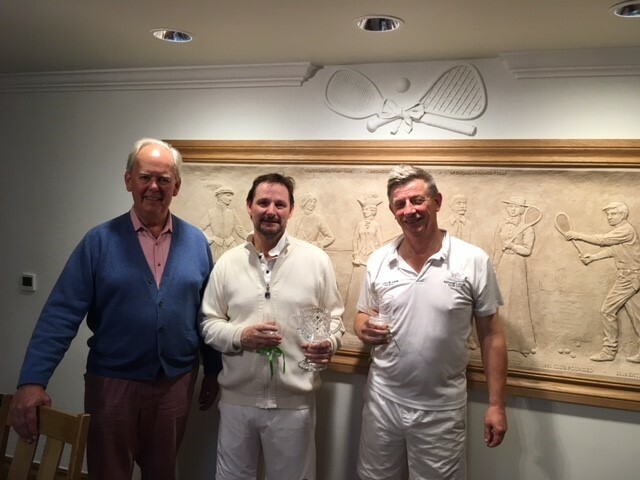 There was some very good tennis played on the Saturday with Hereward Taylor & Robert Dolman extending their winning run to 7 matches after their success two weeks earlier in the Hennell Plate. The match of the day was Tim & Simon Armstrong against no2 seeds David Fortune & James Deuchar. James & David were looking like firm favourites as 5/2 in the first set but Tom & Simon fought back and took it 6/5 and then took the second set 6/4. 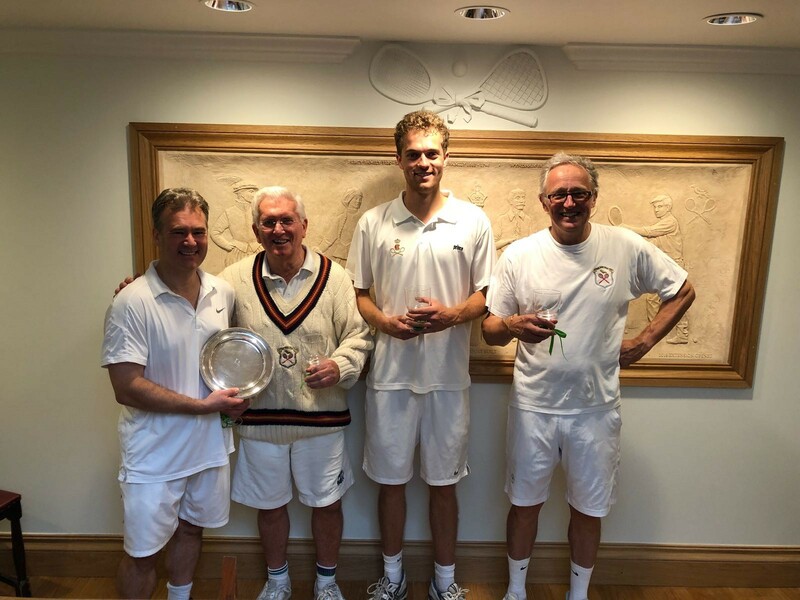 On the Sunday the first Semi- final was between no1 seeds Nick Chambers & George Andrews against Adrian & Guy Warburton. It was very close early on in the first set but Nick & George were just too steady and won the match 6/2, 6/1. 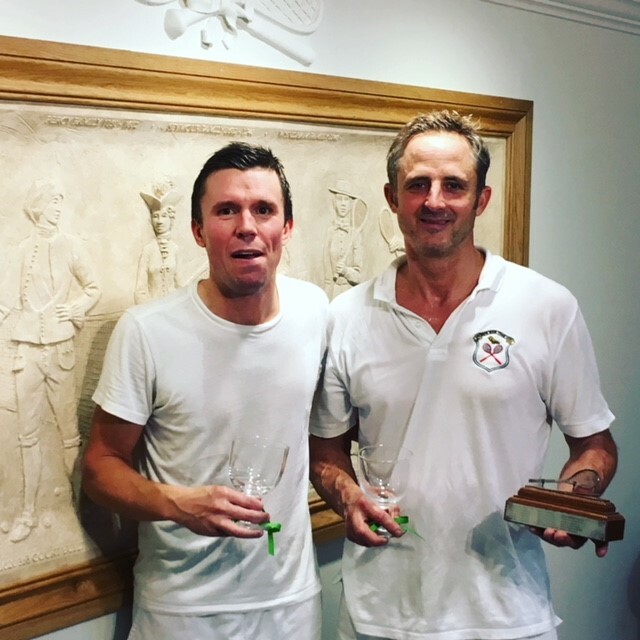 The second semi-final saw Tim & Simon Armstrong play a very good game to bring Hereward & Robert’s run to an end with a 6/1 6/3 victory. It would seem that the match rather took its toll on the father son partnership as in the final Nick & George were simply too good for them and won the match 6/1 6/2. Congratulations to the winners and especially to Nick Chambers who has won the trophy for two years in a row. Thank you to Philip and Lyn Robinson for providing a great lunch and to those supporters.